LodgeCraft offers a great selection of rustic style coffee tables online and in our Montana showroom to match your unique aesthetic. Featuring authentic reclaimed wood, we have rustic wood coffee tables with drawers and extra storage. We also have numerous alder, pine, antler, and log coffee tables from America's top rustic furniture manufacturers. Available in a range of finishes to complement your home, choose from pine, hickory, oak coffee tables in log, rustic mission styles, barnwood, reclaimed and more. Whether you are furnishing your cabin by the lake or your ski lodge, we have the perfect rustic style coffee table that will add style and functionality to your humble abode. Since 1988, LodgeCraft has been providing high-quality furnishings for homes, lodges, mountain modern, and rustic settings worldwide. Explore our website to browse our versatile collection of rustic style and log coffee tables. If you live locally or are in the area, come visit our showroom in Montana for the ultimate selection. 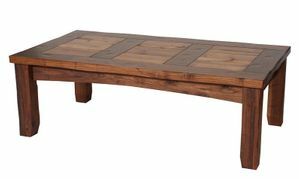 We look forward to helping you choose the perfect rustic style coffee table that is sure to make your home the talk of the town. Log Edged Coffee Table 48"
Solid Wood Coffee Table 48"